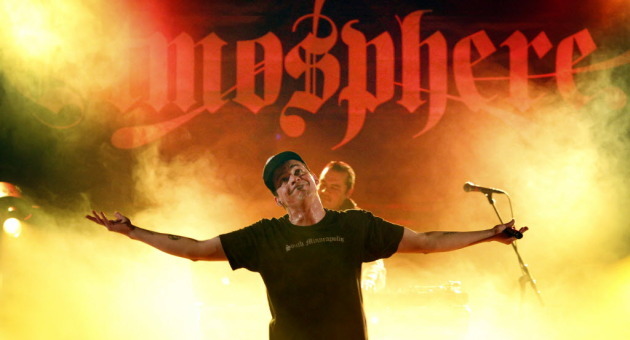 Hip hop duo Atmosphere is ready to hit the road with a fall concert tour through U.S. Atmosphere will kick-off this tour on Oct. 5th at Intersection – Grand Rapids, MI. Atmosphere will be performing in support to its eighth studio album ‘Fishing Blues’ – including shows in cities like Detroit, South Burlington, New Haven, Pittsburgh, Washington, Lancaster, Brooklyn, Indianapolis, Carrboro, Asheville, Baltimore, Charleston, Orlando, Fort Lauderdale, Pensacola, New Orleans, Memphis and many more. Atmosphere will wrap-up this concert tour with final show at The Cowan – Nashville, TN on Dec. 8th. Tickets are available for sale at Ticket Hub. UPDATE: Atmosphere will be extending tour to 2019.